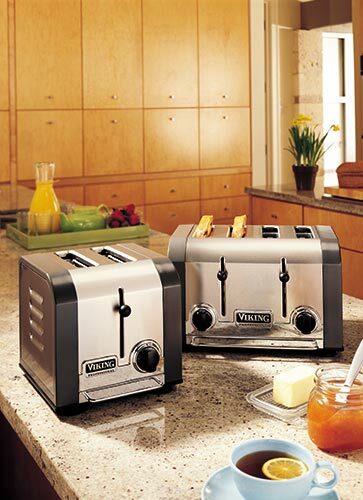 You can have professional style toasting in your very own kitchen with the Viking toaster, the 2 Slot Version. Crafted from stainless steel with smooth rounded edges for easy cleaning. Viking Exclusive control knobs with multiple browning options including re-warm. Wide slots to accommodate the toasting of larger items such as bagels. Insulated for heat retention to maximize toasting and allow the unit to be virtually cool to the touch. Convenient stainless steel front pull out crumb tray for easy cleaning.Hydraulic engaging and lifting action levers UL Agency certified for home use. So , if a mood of toaster frenzy hits your kitchen, this new product will do the job.